One or Two People — Ginger writes. I was at my friend Becky's house on Saturday morning and she told a story that I can't get out of my head. 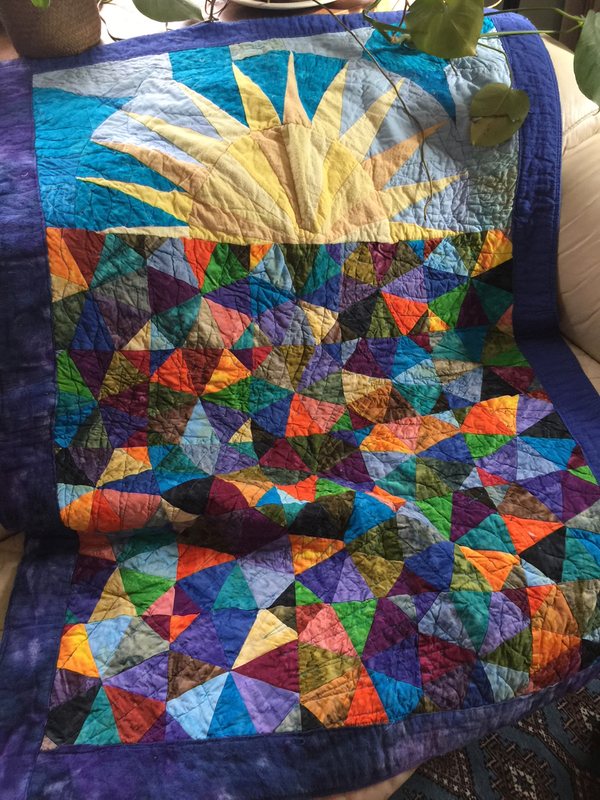 In the context of a conversation on what we mothers do, Becky mentioned that a kid was at her house recently and noticed the colorful baby quilt belonging to Becky's baby son Arthur. The boy asked whose blanket it was, and Becky told him it was Arthur's magic blanket (which she made, by the way). Becky then asked the little boy if he had a magic blanket, and he said "No, but my mom is magic." I couldn't help but wonder who this mom is, and what makes her magic. I wonder if she tells her son she is magic, or if she doesn't have to. I also wonder what might make me magic to my kids. Magic means it's too good to be true. Magic means you aren't being "raised by wolves...or like the parents were trying to be terrible. Or were punking you," as Anne Lamott remembers her childhood. Magic means the work in my own heart is working its way out in the everyday, connecting me to my children, providing safety and comfort and fun just like Arthur's little blanket. It feels like there is so much more to me than my kids realize. Marilynne Robinson wrote in Gilead that "the parent is a greater mystery, a stranger in a sense." I sit in my room and read and write and think and thank and pray. I dig deep in these quiet hours. I copy words to help me and I find words inside myself to bring to the page. I set and reset, always in the hope that who I am becoming will help my children in who they are becoming. I never thought of calling this handoff magic, but anything that gets me out of myself to be a person for others is just that. This Thanksgiving, I want to give my kids a table and a turkey, but also a tone. I want to love them as I love myself. I want to set a grateful heart on display, and "not be flustered and snippy" as my friend Amy so accurately described what becomes our tendency in moments of too many people, too much food, and too little time and space. As my kids are setting the table, may I be setting the tone. May I be magic to them, even if they don't realize what it means until they are the ones making magic in the kitchen, and in their own homes, twenty years from now.